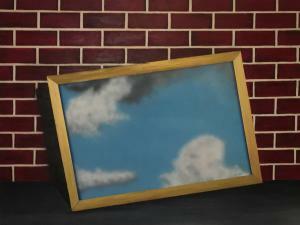 Previously, I did a painting called Outside In where a couple was dining indoors and clouds drifted through the window, with one of them enveloping the ladies head. 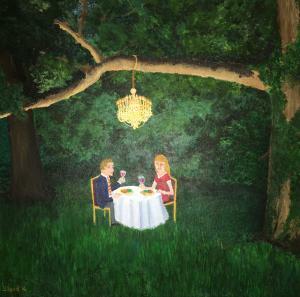 I decided to do another painting called Inside Out where a couple would be dining outdoors, set amongst trees. I decided to hang a chandelier from a tree branch to add a little touch of elegance and the unexpected. The couple were a challenge for me - too often I think the people in my paintings look more like cartoon art. I've decided that's okay - it's just my own style though I wish I could give more depth and character to all of my characters. There's a lot of detail in this painting - right on down to the food on their plates. But there's also a lot of interpretive images where branches and leaves are hinted at but not really defined. This particular painting may not be in my normal genre - yet it still has a look that makes it uniquely my own. I enjoy painting them, even if nobody else enjoys viewing them! I've been a part of the Pixels community since about mid-June. I've tried some initial email marketing and that, for the most part was a failure. I've entered a variety of contests. Joined three appropriate groups and followed others in those groups. And to date, I've sold a handful of items - an iPhone case, some pillows and tote bags. Granted, there are millions of pieces of art on this website. I have seen some truly fabulous works - in all media and in a wide variety of subject matter. I guess that's the frustration that so many artists experience. We love to create, we love to push things out to the public and say, "Look at me", but bottom line, art is a tough sell. Unless you learn how to build a name for yourself and develop an audience of followers, you're just a dime a dozen - if even that. I just wish more people would start buying. I don't know who you are or how you found me but I'm glad you're taking a few seconds to read these words. 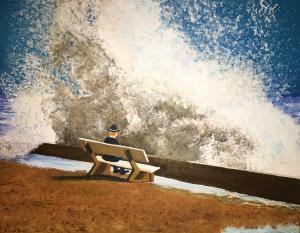 I just joined Pixels.com - I have more than 70 paintings sitting around my house, collecting dust and not being seen by the world. My subject matter is almost always interesting. My style is pretty distinctive. Most of my painting titles are plays on words. I'm just now beginning to upload a few and we'll see if anyone is interested in them as potential t-shirts or greeting cards or tote bags or whatever. I hope you enjoy what you see and I assure you, there is plenty more to come.